This is one of the desserts I served on Thanksgiving. I’m pretty sure that galette translated means “I seem to have misplaced my pie plate”. No matter, all you need is some pie dough, fruit, sugar, a little flour and vanilla and you’ve got yourself a rustic beauty! You can put this together quickly, I like to think of it as a pie without all the fuss! 1. In the bowl of a food processor combine flour, salt, and butter. Pulse until mixture resembles course crumbs. Add ice water, a tablespoon at a time, until dough begins to clump. Form into a disk by hand, wrap in plastic and refrigerate dough for at least an hour. 2. Roll out dough on a lightly floured surface to a 13″ round. Transfer dough to a parchment lined baking sheet. 3. Peel, core, and slice the pears, toss with lemon juice. Add sugar, cinnamon and vanilla, fold in the raspberries. 4. Scoop the fruit onto the dough, leaving a 2 inch border all around. Fold the dough over the fruit and pleat the edges as you work your way around, you’ll wind up with a tart that’s approximately 9″ in diameter. Place the tart in the freezer for an hour, this will help it keep it’s shape. 5. Preheat oven to 350º, remove galette from freezer. Make an egg wash by beating an egg with a teaspoon of milk, brush on the pastry, and sprinkle with sugar. Bake for 50 to 60 minutes. 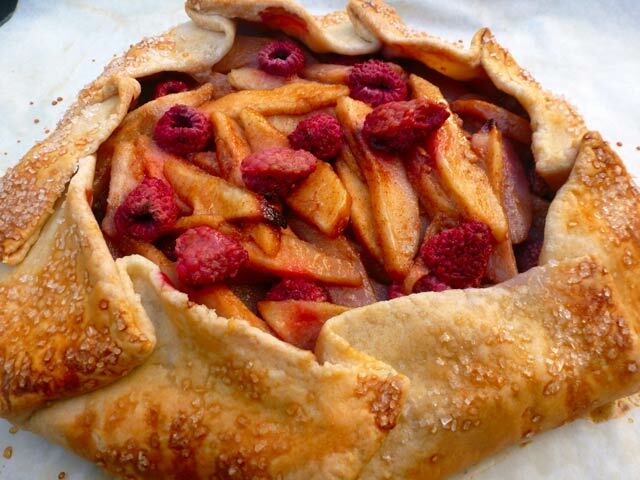 This entry was posted in Glorious Food, Lovin' from the Oven and tagged fruit tart, pears, raspberries. Bookmark the permalink.